Believe it or not, I was very bad at making any gravy with Paneer, be it Kadai Paneer, Paneer Makkhanwala, Shahi Paneer, Matar Paneer or Palak Paneer; the taste was never what I dreamed of having and I never knew why. 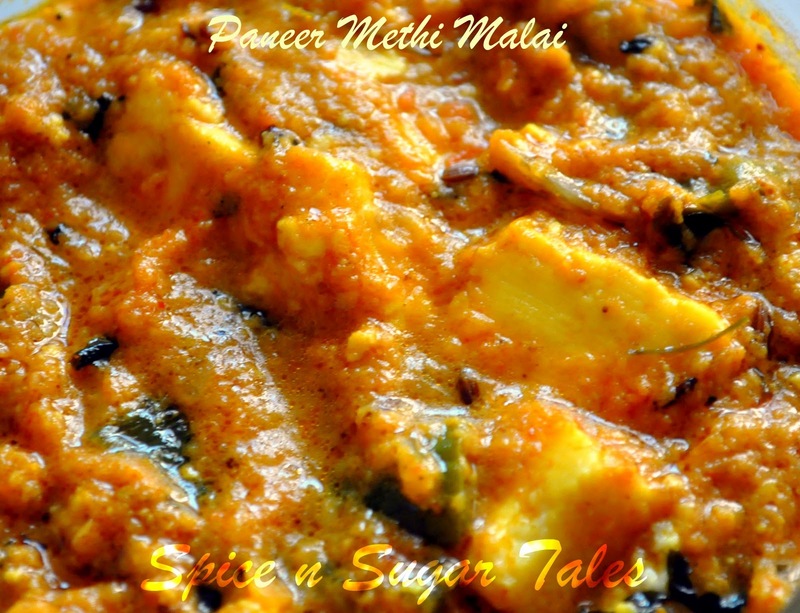 I always used to trouble all ' Paneer Recipe Maestros' for their recipes, their exact way of cooking, and what not, but I think God never wanted me to cook it, rather I was privileged to gulp the whole plate cooked by someone else. At times it was fine not to cook and just eat (Well, who doesn't want that! :P) but the other times I used to be so nervous of being a bad cook. This is not the story before my marriage because then I knew no cooking at all, so all recipes were alike and all all failures in cooking were alike, too. But after marriage, when the spirit of cooking was dancing on my head, I wanted to make everything, and that too with interest. 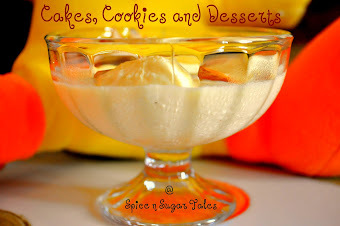 I would not lie here, I became good at dessert handling quite soon but vegetables had always been my brittle line. I still struggle with some which are traditional and unique but the love and zeal to try till I go perfect keeps it all alive. Since all Hindi movies must have a happy ending, so has to be with me. My story on Paneer had to find a happy end and see, I'm sharing this recipe with you guys so delightfully and with a 'cheese' ( don't think about cheddar or cottage cheese here, it's just about my smiling lips that say 'cheese' ). Cottage cheese is a mild-tasting, high-protein cheese curd product. Made by curdling milk and draining most of the whey, or liquid, from the solid product, cottage cheese is essentially unprocessed or raw cheese. Since cottage cheese is low in fat and high in protein, it's the perfect food for anyone who is watching their weight. A little known fact about cottage cheese is that it's a favorite food for athletes and bodybuilders who aren't trying to lose weight. Cottage cheese is low in carbohydrates and full of healthy vitamins and minerals. A half cup serving contains about 120 calories, 5 grams of fat, 3 grams of carbohydrates, and 14 grams of protein. A turophile (pronounced toor-uh-file) is one who loves cheese. - Cottage cheese should not be left outside of the refrigerator for more than 2 hours. - It takes 100 lbs of milk to make 15 pounds of cottage cheese. - Cottage cheese is also known as pot cheese, farm cheese or farmer's cheese. Wash the paneer/ cottage cheese well and cube it. Keep the size small and not too big. Take the onions and grind them into a paste. Separately, puree the tomatoes and keep them aside. If you are using garlic cloves instead of paste, you could add them while pureeing tomatoes. Add chopped capsicum to it and saute for 3 minutes. Now add all the spices (just add 1 tsp garam masla and leave 1/2 tsp for the finishing flavor) and cook. Throw in the tomato puree and cook till the oil separates. You'll feel the aroma lingering in the whole kitchen by now. Sprinkle salt and kasoori methi into the gravy. Adjust the texture by addition of water. Now add the soft paneer cubes to the gravy. ( I do not shallow fry the paneer cubes as that would make them slightly sticky). Cook covered for 3-5 minutes on sim/low flame. This will infuse the flavor into the cubes. Do not stir too often else the paneer cubes will break. Shower the remaining garam masala and add the fresh cream at last. Cover and cook for 2 minutes. Serve the aromatic paneer with Tandoori Roti/ Naan/ Lacchha Paratha. 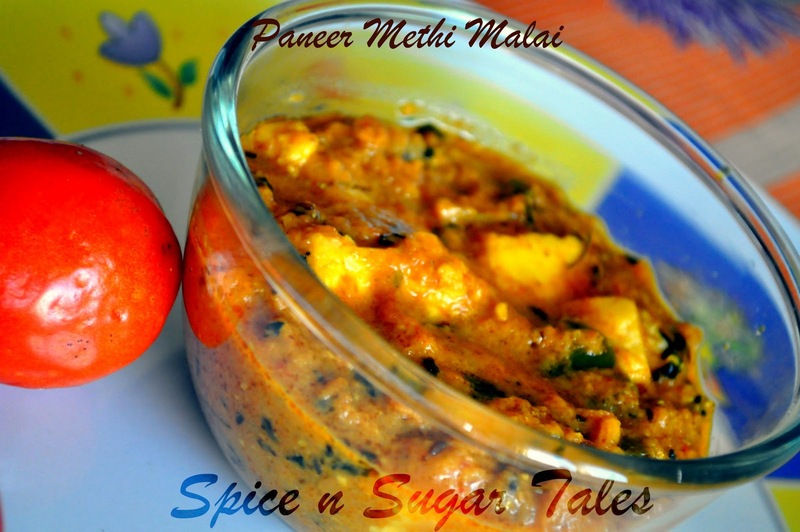 The quality of paneer/cottage cheese holds the maximum importance for incorporating the real taste. If the paneer is not fresh/ old/ sour, it will spoil the entire gravy. Make sure you get fresh, non-sour-smelling paneer from the market. You could check the freshness by its smell and best by tasting it. If the tomatoes are very sour, reduce their quantity. 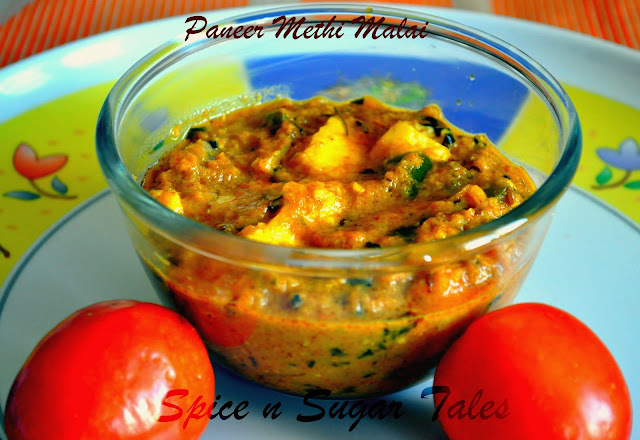 In place of Kasoori Methi, you could also add fresh fenugreek/ methi leaves. Never leave the onions undercooked in haste because they can win or lose you the entire game. This will make such a scrumptious side dish for rotis. Lovely clicks Anjali. 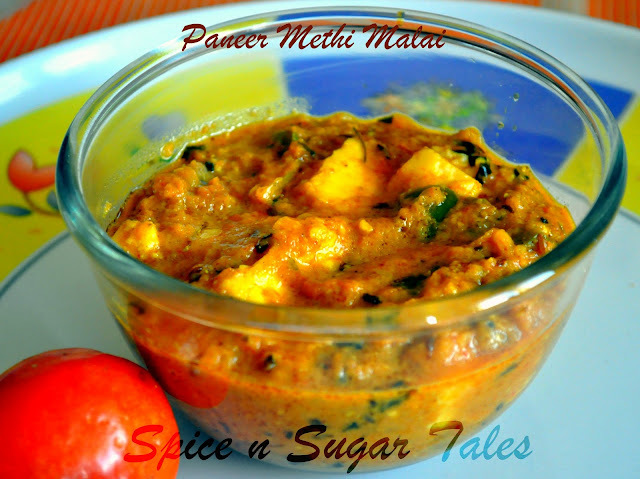 such an yummy an creamy dish perfectly clicked..
wow...such a creamy and mouth watering dish, looks so tempting dear..
Love paneer and methi combo. Mouthwatering. Such a droolworthy subzi!!!! All i need are some hot rotis to polish off this delish & creamy curry!! !